There is little risk of anyone seizing power, declaring martial law or suspending the constitution in Britain; instead through a hundred lesser acts, the state takes more and more power to itself, and our protections becomes steadily weakened. We are comforted by being told that these are a response to an extraordinary situation; but we have seen time and time again that powers given supposedly to fight terrorism are used by the police for far less significant threats, such as checking up on whether people have claimed the right benefits or tax rebates, or even spying on protesters or campaigners. I’ve always found the tendency of some on the left to invoke the spectre of a ‘police state’ to be worrying and irritating in equal measure. Even in its most sober versions, it tends towards a ridiculous degree of overstatement that is offensive to those who have actually lived under such conditions. It also contributes to an atmosphere within which conspiracy theories can thrive on the left, not least of all the appearance of 9/11 trutherism in the UK. The first is that there existed a surprisingly widespread belief during the mid-1970s that, were the muddle to continue, it might need to be ended by force, with a military takeover. A coup was not outside the realms of political possibility (and we now know that rogue forces within the secret services made cack-handed attempts to organise one, with either the Duke of Edinburgh or Lord Mountbatten as the preferred strongman to replace Wilson). The particular focus of these fears was rising inflation. It was a common assumption at the time that no democracy could survive a sustained bout of inflation above 30 per cent – and in Britain the rate hit 25 per cent in 1975. It was commonplace to invoke the baleful example of Latin America, where the global economic crisis of the mid-1970s led to the collapse of a number of democratic regimes. The economist Milton Friedman suggested in 1974 that the failure to control inflation had been responsible both for Heath’s replacement by Wilson in Britain and for Allende’s replacement by Pinochet in Chile. It cost one man his job; the other his life. The barely veiled sense of threat was apparent. Today the talk of democracy-destroying inflation has more or less disappeared. Yes, we face a mix of rising prices and stagnant or falling wages – the “cost-of-living crisis”, as the Labour Party likes to call it – that has some echoes of 1970s stagflation. But the scale is very different. Ours is a slow-burning, incremental squeeze on living standards, not the threat of an inflationary rip tide sweeping away savings and security. In large part because of the fears generated in the 1970s, we now have economic technicians in charge of an independent central bank whose job is to ensure that inflation remains more or less under control. Likewise, the idea that the current crisis might result in a military coup seems laughably remote. We worry – or at least some of us do – that the military-security complex is squeezing what is left of our privacy by spying on our communications. We don’t, however, worry that the security services are secretly plotting to install a member of the royal family as an unelected head of the government. What we’re seeing is not the emergence of a ‘police state’ but rather the drip-by-drip erosion of liberties in conjunction with a growing inability of any political agency to reverse the trend. The issue doesn’t capture the attention of a distracted public, the political socialisation of MPs mitigates against concerning themselves with such matters and the time horizons of party-politics incentivise headline grabbing announcements concerned with the performance of virtue rather than the practicality of policy. Creating an obligation to monitor and report extremism – Colleges, schools, prisons, GPs and councils will now have a legal duty to prevent people being drawn into terrorism. Schools, nurseries even GPs will be required to monitor those they provide services to and report anyone they believe is at risk of, or has in fact been drawn in to terrorism. Universities will have to draw up policies on extremist campus speakers, and prisons will be required to have policies for dealing with radicals. The Home Office will be able to get court orders obliging bodies to comply with their obligations. 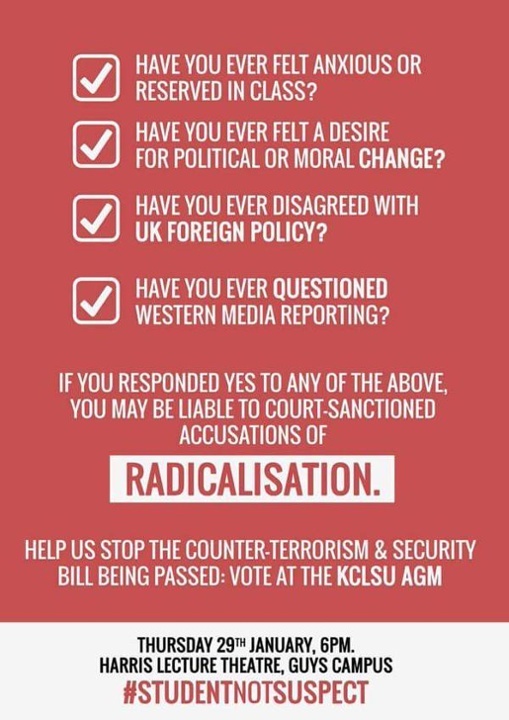 “De-Radicalisation” Panels – The Bill creates a legal duty that will require local authorities to establish a panel to refer people identified as being at risk of ‘being drawn into terrorism’. The composition of that panel is set out in the Bill, and its purpose is to draw up a “de-radicalisation” plan for the person identified as being at risk. The Bill makes no provision for the person identified to have legal or other representation, or in the case of a child, to have a parent present. But what I find so disturbing is that this legislation seems as much to do with Theresa May positioning herself as Iron Lady 2.0 in order to compete for the leadership of the Conservative Party as it does with any reflective desire to solve a social problem, as much as I might disagree with either the interpretation of the problem or the proposed solutions. If ‘extremism’ entails ‘opposition to British values’ and those values include ‘free markets’, it’s not unlikely we’ll see some of these new powers brought to bear upon anti-cuts protesters. These will be situational application of new powers rather than a considered attempt to suppress dissent. But the effect will be that possible agencies of change outside parliament will come to be muted in much the same way as those within it. Thus reinforcing our long post-democratic drift into a state of perpetual crisis in which “nothing gets sufficiently broken for anything to get finally fixed”.